I believe one of the most powerful uses of mobile technology by nonprofits is cultivation. In other words, use mobile to cultivate and nurture your relationships with donors, members, volunteers, prospects, advocates … everyone. In August 2010 I spoke at the DMA Nonprofit Federation Conference in New York City. And my topic was cultivation with mobile including several examples of how nonprofits are cultivating with mobile. 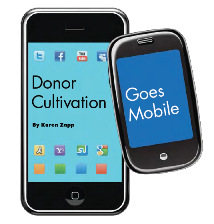 What you see on this page is a 3-page article I wrote titled, Donor Cultivation Goes Mobile. It was published in the September 2010 issue of the DMA Nonprofit Federation Journal. And it is published here with permission. At the bottom of this page you'll find a link if you want to read it online. That's just a sample of what you'll read in my article below. Enjoy. I have another resource for you. Earlier this year I wrote an A-to-Z primer for anyone new to the world of mobile, Mobile for Nonprofits - Connecting to Donors Through the Power of Mobile. If you follow the link you can view the Table of Contents. You'll see how thoroughly I cover the subject in simple non-technical verbiage. The primer (a guidebook) is also packed with creative nonprofit examples on how to use mobile. I invite you to get my guidebook on mobile for nonprofits. And if you don't learn anything new, if it doesn't help you better understand the potential of how mobile can help your nonprofit … just let me know and I'll give you a full refund and you can still keep the guide. Finally, I promised to give you a link to the September issue of the DMANF Journal where my article was originally published. You'll find my article on page 20.